In my relatively long relationship with cooking, there is one arena in which I've never had much interest in exploring. Baking has never been my thing. I don't like sweet things and I'm very impatient when it comes to measuring. All of it seemed like a phaff, excepting one thing that always managed to turn my head. Baking sourdough bread. My first loaf ever. Pretty bad, but still edible actually. The golden orbs of crackling crust, slicing into it to reveal the airiest and tangiest tasting crumb, the blob of soft-as-pillows dough, the science behind the fermentation and the mysteries of 200 yr-old starter. I pondered these things the way a child stars at a toy in a shop window at Christmas time. But I never tried it. It seemed like an insurmountable hurdle, and so many bakeries made it so well anyway. So I bought my loaves, and went on my way. Then one day this summer, something snapped, as if my inner child had smashed the window, snatched the toy and ran like hell. I went to the Do Lectures, (always a time of epiphany,) bought Do Sourdough and a packet of powered sourdough yeast and started baking 1-2 loaves per week. One of my first good results. You can see the effects of my baneton basket, which make a beautiful pattern. I'm now at around my 16th loaf of bread. I've had a lot of failures, the first 5 loaves were made with a lick and promise, and a lot of sticky dough getting all over my kitchen. 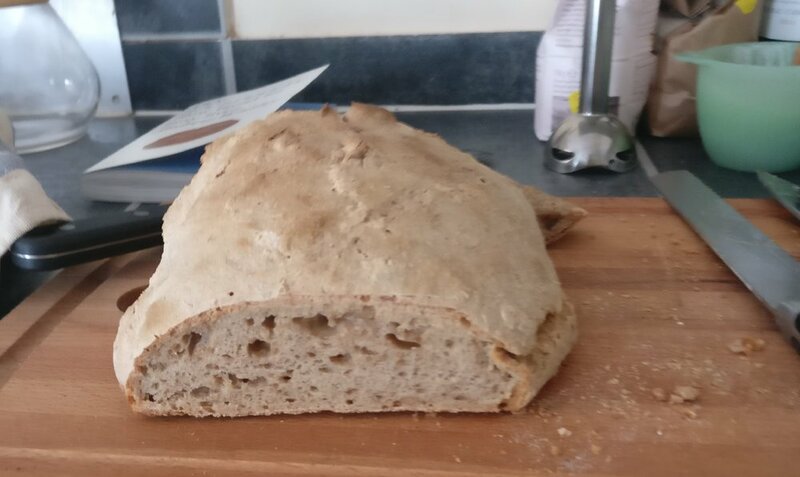 This was my whole wheat loaf attempt, tasted amazing, satisfyingly dense. This blog isn't a sourdough recipe or a lesson. Others have done that much better than I and I will link to a few of my favorites. This is just a list of things that I've learned that I wish I had been able to read before I began my bread trials. I hope that reading this list helps get you started. The most important thing to remember is that you must persist through the failures, it's a difficult skill, but when you pull your bread out of the oven, and see beautiful bubbles and the perfect burst through the scoring lines, it's a wonderful feeling. One of my best loafs. Took a while to get here. One of my finer creations. The success was short lived, my next attempt was flat as a pancake. I started with a copy of Do Sourdough, which had lots of helpful information on the science of fermentation and what's happening at various stages, but it felt overly complicated as I was first getting started. There were no pictures that let me know if I was on the right track. I ended up with some really unfortunate loaves that I had to bin. I turned to YouTube sourdough lessons, and watched videos from some bakeries that I know and love, like Tom Herbert from Hobbs House Bakery and the boys from E5 bakery in Hackney. 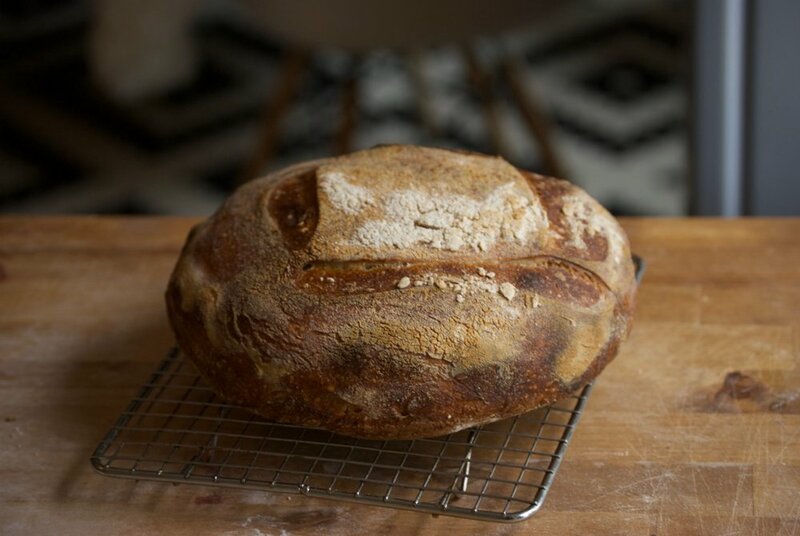 My real break-through came when I bought the Tartine Bread cookbook. In simple and straight-forward language, the book walks you through a great technique, and provides detailed pictures that really help you understand if you're doing it right. I started with powdered yeast at the beginning of my sourdough loaves. The reading I had done seemed to indicate that I would have usable starter after a few days. Now a few months into my journey I realize how silly that is. It actually takes many weeks of developing your starter to get it to the point that it will cause your bread to have a beautiful rise. Rather than creating your starter from scratch, I recommend heading to a bakery in your area that makes a sourdough you like and asking them for a portion of their starter. Most will sell you a enough to get started, you only need about 3 tablespoons. E5 bakery in Hackney if you're London based would be a good source. Another point of confusion was how much starter you need in order to create a levain, which is the mixture you use to mix your dough. You actually only need about 1 tablespoon of starter, that you add fresh flour and water to to create the levain. You can take a big spoonful of batter from your starter jar, add to another jar, add flour and water, and mix until smooth. You can then feed your jar of starter to keep it developing and put it back in the fridge. In terms of consistency, you want your starter to have the consistency of really really thick pancake batter. Mine was much too watery at first. The correct ratio of flour to water when you refresh is important. You really want to see your starter double in size or more and use it at the peak of it's growth before it starts to fall down. This blog on the development of the starter was really helpful to me as I tried to understand how starter expands, when it's ready, and how to know when I shouldn't use it. Making sourdough is a bit of a messy business. The starter is like pancake batter and the dough itself can be terribly sticky and difficult to manage. It's helpful to get a few things that help you work with the dough while it's rising. When I first started, I was improvising and things were quite hairy. The first thing I bought was a metal dough cutter and a rubber bowl scraper. This are helpful for pulling the dough out of the bowl, and also turning it on the counter as you shape it. I also got an OXO silicon spatula, which really helps stir the starter in your jars. When it comes to the final rise, getting a baneton to put your dough into is preferable to a bowl, and helps your bread achieve a great shape. If you want to make bread a lot, it's also helpful to get a few things to store your ingredients, so I got a few storage containers at IKEA that keep the various types of flour tidy and contain the mess. Here is what I think it is a starter kit for sourdough. Altogether you can get these items from Amazon and IKEA for about £20-30. I was a bit put off by the need for a digital scale. As I said before I don't like to measure things. Through my reading, what I came to understand is that with sourdough you should measure to try to hit the right flour to water ratios, but you also need to make allowances for your environment. I live in England, it's cold and wet here. That means that I need to hold back a bit on the water. Generally the rule is give equal importance to measuring as you do to the look and feel of your dough. It's good to know how much water seems to work for you, how your dough reacts when it's it warmer temps, how your oven holds heat. It is a good idea to keep track of the temperature of places where you'll rise your starter, the room where you mix your dough, and the inside of your oven with the oven light on. Things happen slower at 65-74F degrees, they speed up if you can hold the temp of the starter and the dough in a place around 82F. A few of the folks that I read keep a journal of temp, timings, ratio of water to flour, every time they bake a few loaves. It's not a bad idea to track these things, at least for a little while, as you get your bearings. At the beginning, when I was watching videos, I was confused. The dough in the videos didn't seem very sticky. In general, my dough was almost impossible to work with. Sticky and terribly messy, it never seemed to get to the point of workability that I saw in the videos, and often left a mess all over my counter. It wasn't until my starter had developed enough that I started to notice my dough too became manageable. The other thing thing that really helped were some techniques that I picked up in Tartine Bread, about resting the dough, and letting it bulk ferment, which allow the gluten to develop, which decreases stickiness. If you find your dough is sticky, start with your starter. Does it double in size and float when you drop a bit into a bowl of water? If you feel your starter is on point, then work on your patience, let your dough rest after mixing, let it bench rest before shaping for the final rise, and make sure you give it enough time during bulk fermentation. I started with sourdough in a burst of enthusiasm, and I wanted great loaves the week I started. Luckily, I had had enough friends who had been through the sourdough trials, that I knew that that was wishful thinking. Between your sourdough developing and you learning how to gently handle the dough and gather the tools you need, it's going to be at least a few weeks before your loaves start to look something like. If half the joy is figuring it out, and the other half is the love of making it, then you're probably going to do alright. If you're getting into it just so you have great sourdough to eat, then it's probably not going to be a hobby that you stick with. But the pride and joy that you feel when you finally take a crackly golden orb out of the oven and say "I made that," it worth your kitchen floor being covered with a fine mist of flour most of the time.